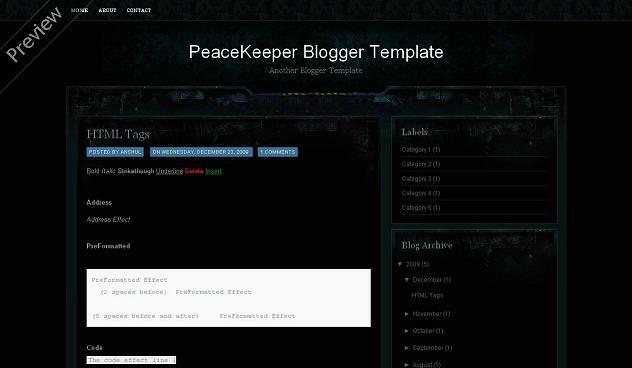 PeaceKeeper is a two column blogger template with sidebar to its right and post section to left.The theme is designed by web2feel and converted by me to blogger.The design is gorgeous and it looks damn proffesional.Top menu links are ready for you.Seo for title has been done and it supports all blog features and is compatible with all browsers.The template is dark and has specially made for dark template lovers.It uses very high quality images and i am sure everyone will gonna like this for sure.Comment system too is looking great with simple design. Other blogger templates you may like are Greymagic and Simplebox. but i think that you should put a search bar on the top (like beside your logo) so that we can search for other things on the same page and do not need to go all the way back to the frontpage and scroll down for the search bar. also, the links at the categories are not working too. i wish this could help you improve on the design of your great blog. @daryl ya i also want as at header there is no place will provide in blogger sidebar i think.and no dude all links are working fine . Thanks for converting the template. It's really cool!